Inventory We are a resale marketplace, not a box office or venue. Ticket prices may exceed face value. This site is not owned by Alamodome . The Alamodome is a domed 65,000 seat, multi-purpose facility that is primarily used as a football/basketball stadium and convention center in San Antonio, Texas, U.S. The facility opened on May 15, 1993, at a cost of $186 million. Along with placating the San Antonio Spurs ownership's demands for a larger basketball venue, the multi-purpose facility was intended to increase the city's convention traffic and attract a professional football franchise. The Spurs played basketball in the Alamodome for a decade, then became disenchanted with the facility and convinced Bexar County to construct them at the San Antonio Livestock Exposition Inc. a new arena now called the AT&T Center. 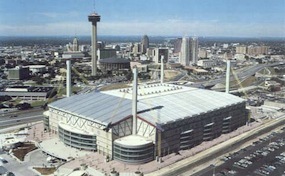 The Alamodome, originally intended to promote football in San Antonio, has become a staple for Texas Tourism. The venue also hosts events such as Monster Jam, Disney on Ice, and the Valero Bowl to appeal to all interests and ages. Built to cater to the needs of all, it houses 7 Elevators, 88 Restrooms, 25 Concession Stands, and 2,836 parking spaces; the Alamodome is among the largest stadiums in the United States. DomeSanAntonio.com is not affiliated with any primary box office or supplier. We are a privately owned and operated business specializing in sales in the secondary market. To buy tickets for any Alamodome events in San Antonio simply click on the event of interest or call our operators at anytime.